In his definition of the word environment, Kaprow repeats the literal meaning – “that of a surround” – and adds that “the particular parts are not necessarily placed with some kind of formal care for their external cohesion, but rather as an interaction between the person who is being surrounded and the stuff of that environment.” By making the elements dynamic as a result of the visitor’s action, the environment comes across as a work that is not set, that is open to variations. 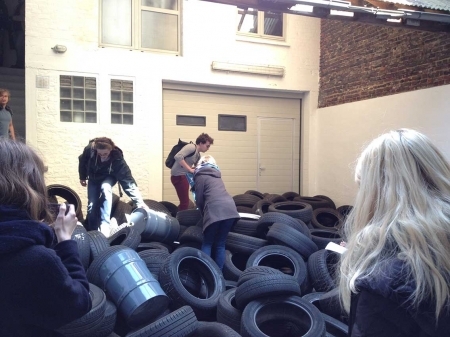 In Yard, “visitors were encouraged to walk on the tires, and to throw them around as they pleased.” Visitors first experienced this in May and June 1961 at the Martha Jackson Gallery in New York, in a group show titled Environments, Situations, Spaces. This was also the title of the catalogue containing statements by the featured artists Jim Dine, George Brecht, Claes Oldenburg, Robert Whitman and Kaprow. They took possession of all the gallery spaces, immediately placing the visitor in an unconventional exhibition. Claes Oldenburg chose the basement to show The Store, for example. George Brecht’s Chair placed three chairs in various sites, one of them yellow, in front of the gallery, on the sidewalk. 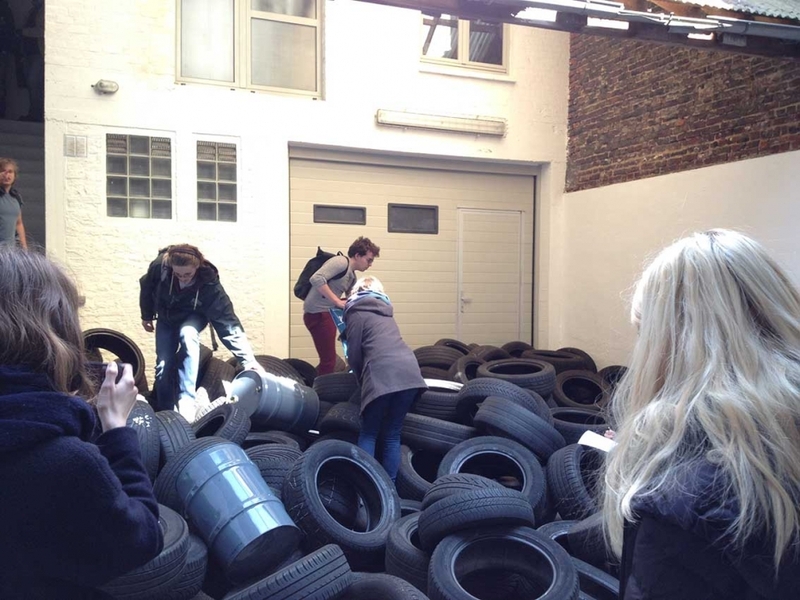 Kaprow himself chose the courtyard, covering it with a heap formed by hundreds of worn tyres. This courtyard had originally been the gallery’s sculpture garden. Five forms emerged from the piles of rubber. These were sculptures by Barbara Hepworth and Alberto Giacometti “that could not be moved,” and that were wrapped in black plastic tied with string. In 1961, this exhibition contrasted with others that more obviously respected the white, rectilinear space of the gallery, or that observed the injunction to “not touch the works.” It also had an impact on the city. The gallery was surrounded by other buildings, other places of life, and the exhibition, particularly the environment Yard, provoked successive visits by the police, firemen and health department. Jeff Kelley recalls that water collected in the tyres, causing a colony of mosquitoes to breed there and neighbours to complain. This was no smooth, contained exhibition. Made of worn, foul-smelling tyres, Yard was a reminder of what consumer society usually hides: waste. 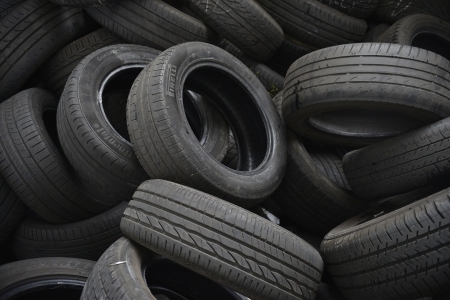 The tyre referred metonymically to an emblematic product of American society: the car. Writing in July 1961, journalist Jill Johnston drew this parallel between the objects exhibited and consumer products. The gallerist, she noted, not without irony, was exhibiting “baffling noncommercial commodities, things you can’t use or sell or label even.” The products were there, covered in plaster, gutted, deformed, suspended, piled up, downgraded and definitely not fixed, far from any commercial relation. The reliefs and sculptures in Claes Oldenburg’s environment The Store, made of plaster painted in gaudy colours, were paradigmatic. The artist crudely imitated foods and food containers, fragments of advertisements and clothing that he had seen in neighbourhood shop windows. The products featuring in the environments displayed at the gallery were obsolete and deliquescent. They were resolutely unproductive. In this sense, this exhibition could be described as a melodrama of the society of mass consumption. Some of the photographs taken during the presentation of Yard in 1961 were influenced by the photos taken by Hans Namuth in Pollock’s barn-studio in July 1950 and published in 1951 in Art News. For example, the photograph in which we see Kaprow smoking a pipe surrounded by tyres, with his son clambering over a tyre behind him, might be seen to recall the framing chosen by Namuth to show Pollock at work, seemingly wedged between two expanses of canvas: the canvas he has finished or is about to return to, and the canvas he is currently working on. The framing of the photograph in a sense extends the all-over space of the canvas to the space of the studio, and it can be said that Kaprow continued this extension with the environment. Namuth’s photographs also revealed Pollock’s specific choreography when he was painting, his way of moving from the periphery towards the centre. This manner involved a specific state of corporeal tension, with gestures and movements such as flexing, kneeling, stretching, bestriding the canvas and the floor, throwing out filaments of paint more or less forcefully, etc. In another of the photographs taken in the environment Yard, we see Kaprow throwing a tyre into the air. For Jeff Kelley, this image was “as much an instruction as a document.” And that is no doubt how Kaprow read Pollock’s work and Namuth’s photos: as an invitation to explore a new space with actions inscribed in space-time and taken from everyday life. Other events, too, give Yard its place in history, or at least show its importance in this period of transition. In March – April 1961, The Art of Assemblage was put on at MoMA, New York. In his introduction to the exhibition catalogue, the curator, William C. Seitz, drew a connection between the art of assemblage that developed in the first half of the twentieth century and that of the generation of artists now producing environments. Pierre Restany made the same connection in an article written in 1963 which referred, among others, to Kaprow. The environment was, he said of this artist, like “an architectonic extension of collage,” an intermediary form, between early assemblage and the happening. Yard was reinvented several times by the artist after 1961, and after his death in April 2006 other figures in contemporary art did the same. “I say reinventions, rather than reconstructions, because the works differ markedly from their originals. Intentionally so.” Kaprow had already expressed this idea that he would not redo a happening or an environment but would instead change them in the 1950s. It was a position he clarified in the 1980s when he had to deal with retrospectives or institutional demands for the exhibition of environments or happenings – activities that had already taken place. This was clearly the case in 1984 when Barbara Haskell invited him to take part in the group show she was curating at the Whitney Museum of American Art in New York, Blam! The Explosion of Pop, Minimalism, and Performance, 1958 – 1964. In a conversation with Haskell at the time, he stated his refusal to exhibit his past in a literal fashion and his preference for inventing it: “[…] Al wants to do a retrospective of my work back to 1947. I suggested instead the invention of my past […] for example, ‘inventing 1958, 1960, 1963, 1970, 1974, 1980, and so on.’ [...] Almost nothing will appear in the gallery, since the key focus will be on the site-specific work after 1957. And for each ‘older’ piece that is created, I plan several versions in different places and at different times.” This retrospective proposed by Al Nodal did not happen. Nevertheless, the ideas set in motion by this proposition were irreversible, for the retrospectives that did follow were founded on the idea of “inventing my past.” The first, held at the Museum am Ostwall, Dortmund, in 1986, was the manifesto for this approach. Thanks to the support of his Fluxus friend and collector Wolfgang Feelisch, he was able to reinvent, among others, the activity Sweet Wall and the happening Self-Service (1966) in various locations around the German city. 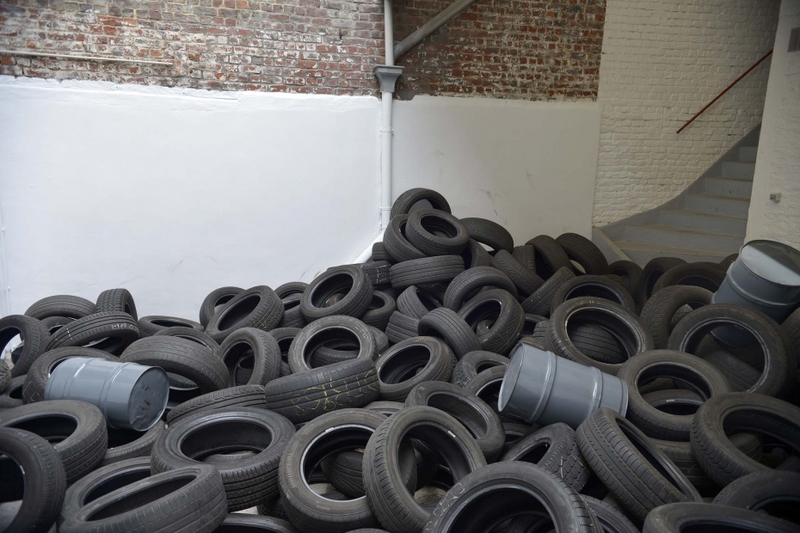 In his second retrospective, Allan Kaprow: Precedings, at the Carter Center for Contemporary Art, Arlington University, Texas, in 1988, the term “reinvention” was written on the communication material. This retrospective had been envisaged as a series of tasks, as a process and not a static event or a presentation of the work uniquely in terms of archive. In the catalogue for this show, Kaprow describes the notion of reinvention: “All these events had been, for the most part, once-only things, and they were meant as changeable events, there was no fixed form in them, depending upon where they were, who did them, so why not continue to change my memory of them.” Reinvention was a way of putting the historical dimension in the background. The new version was to a significant extent motivated by the context, the places and by exchanges of ideas and decisions taken with the participants. The essential thing was what happened at the moment at which it happened, something that would not be repeated. The idea that a happening could be redone by someone other than himself was something Kaprow clearly articulated in the retrospective he was working on in 2005 and that was shown in Europe and the United States (California) after his death on 5 April 2006 (it continued to tour until 2009). Stephanie Rosenthal, one of the curators of this show, pointed out that reinvention gave new generations the chance to experience Kaprow’s art, and that it was the sign of the arrangements he had made to ensure that his works would live on after his death. She also pointed out that “Kaprow stipulated that wherever possible, responsibility should be given to a single leader. The form of the new version would be dependent on the leader, the time, the place, and the participants.” Kaprow was no longer the only person responsible for the reinventions: other people took the role of “leader” determining the form and reception of the work. An artist might choose a focus that would be different from that of an art critic, a musician, a dancer or someone else. Kaprow’s work is thus open and exhibited in a permanent incompleteness. Since 1961, each reinvention of Yard has been based on the same principle: this is the environment that is reinvented, and not another. There is permanence within the variance. The permanent elements, therefore, are: assemble the “stuff” of industrial and/or consumer society; saturate the chosen place; set up an interaction with the public and the surroundings. This does not rule out taking liberties in the choice of place and of the “products” that compose the piece. The former, for example, does not have to be a gallery, as it was in the original; it could be a street, a field, or an open garage (this was the case for the version at the Fondazione Mudima, Milan, in 1991). Likewise, the products are not always tyres. These can be replaced by placards, as in the Yard (Sign) version by Sharon Hayes. The signs were stuck in the lawn of the oldest non-religious cemetery in New York (New York Marble Cemetery). In Yard (Junkyard) by Josiah McElheny, there were no objects but, instead, a travelling-format photograph showing an upwards view of a neighbourhood junkyard. 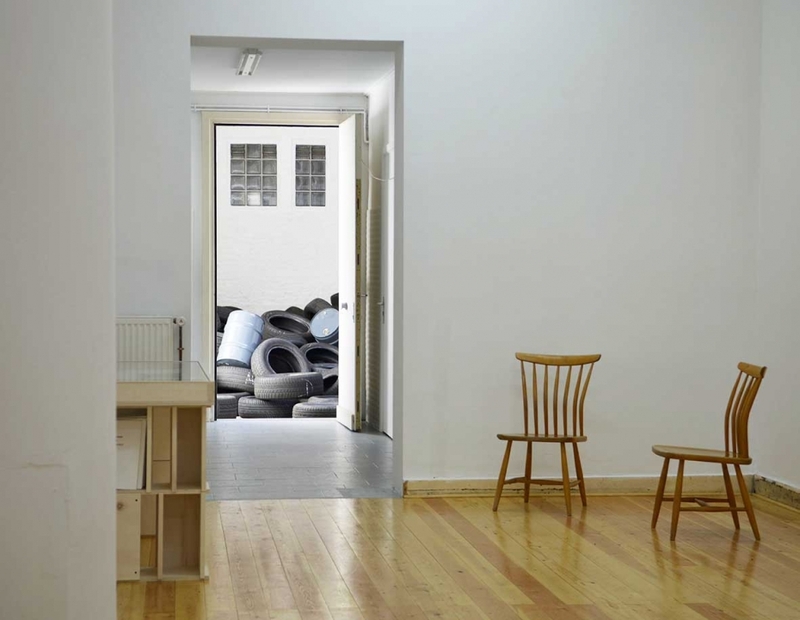 These two versions made in 2009 were organised under the aegis of the Hauser & Wirth gallery (New York, Zurich), with a version of Yard being presented simultaneously in each of its spaces by William Pope. Whatever the approach taken by the reinventer, the effect of the resulting version is to disrupt the silence of a place, to lead the viewer/visitor to experience a known space in a different way. It is an invitation to act in a reinvented space without trying to do anything more than take part. Environment: Size: ca. 20’ × 30’, Certified Allan Kaprow 12/28/91 ». Le circa laisse une latitude. On passe des 6 × 9 mètres new yorkais aux 8 × 7 mètres saint-gillois. Plusieurs versions ont été envisagées. La 1re ouvrir le garage donnant sur la cour (Jacques Donguy et Martin Laborde). La 2e y placer une voiture (Donguy). La 3e : bloquer la moitié du garage par un mur de pneus (Corinne Melin, Laborde), la 4e : fermer le garage (Ferdinand Fabre, Melin, Laborde). Corinne Melin, 5e proposition, a souhaité pouvoir utiliser le local sur rue qui donne aussi sur la cour, encore un souvenir de la Galerie Martha Jackson, l’accès actuel sur l’arrière se faisant par le couloir d’entrée de l’immeuble. Enfin, Christian Schlatter a proposé d’afficher sur les murs de ce local des citations de textes de Kaprow écrits à propos de Yard en 1961. Ferdinand Fabre a envisagé de ne présenter que la lithographie de 1990 de Yard. Elle témoigne d’une certaine ironie, l‘artiste place le mot Yard sur un des côtés du pneu représenté, là précisément où les compagnies qui vendent les pneus mettent leur nom. On a pu voir, le mois dernier à la galerie Fifty One à Anvers des photos de Lee Friedlander commissionnées par le magasine Happer’s Bazaar en 1964. Elles furent considérées comme une contre publicité pour l’industrie automobile. Sur l’une d’elles de vieux pneus sur un trottoir étaient empilés et cadenassés à un poteau de signalisation. Le magasine les refusa. C’est cette critique de la glorification de l’automobile au début des années 60 que Kaprow allait mettre en avant dans la lithographie, critique déjà assumée à l’époque puisqu’il écrit, dans le petit catalogue de l’exposition, que Yard peut être aussi considéré comme une « Junk pile ». La lithographie fait penser à une publicité pour une marque de pneus qui prend sa juste place dans ce local, un pop-up store incertain, un magasin qui vient de s’ouvrir et se cherche une identité à côté d’une épicerie polonaise d’un café portugais, d’une association bouddhiste et de l’entrepôt des Petits riens, sûrement pas une galerie d’art. Car le lieu de l’exposition qui accueille Yard était resté longtemps inoccupé. À quelques encablures de là pourtant, rue de l’Hôtel des Monnaies on trouve l’Hôtel Winssinger, construit par Horta, qui abrite deux galeries. Egalement dans cette même rue, une galerie déguisée qui joue elle aussi une double jeu, Le salon d’art et de coiffure dont l’enseigne fut dessinée par Topor. Les murs laissés vides ou presque du local qui précède Yard en fait une sorte de sas, un lieu de repos avant d’exercer l’activité de Yard, manipuler les pneus. Je vais tenter de rester au plus près de la formule d’origine en suivant les conseils des personnes déjà mentionnées, Corinne Melin théoricienne de l’art, elle a déjà réalisé plusieurs Happenings de Kaprow, Jacques Donguy qui cumule ou a cumulé les professions de galeriste (de Kaprow notamment), critique d’art, expert de la poésie visuelle, lui-même artiste, Christian Schlatter, philosophe et théoricien de l’art, Martin Laborde et Ferdinand Fabre, des artistes. Il en faut pour recréer Yard ! Je tiens à les remercier tous, ils font partie du projet. Remercier ne me donne aucun avantage. J’ai simplement suivi leurs conseils. J’ai déjà tenu ce rôle de « leader ». Il s’agissait d’une œuvre d’Isidore Isou, La Bibliothèque infinitésimale et super-temporelle dont je devais choisir les livres en fonction des théories de l’auteur et les ranger selon son classement. J’agissais comme « responsable de la bibliothèque ». Leader ou responsable, deux mots d’autorité qui répondent à un seul besoin, faire que l’œuvre vive.